We strongly recommend to use the free LibreOffice or Google Spreadsheet to build the CSV import files. Some versions of Microsoft Excel are very poor at managing CSV files and the UTF-8 encoding. 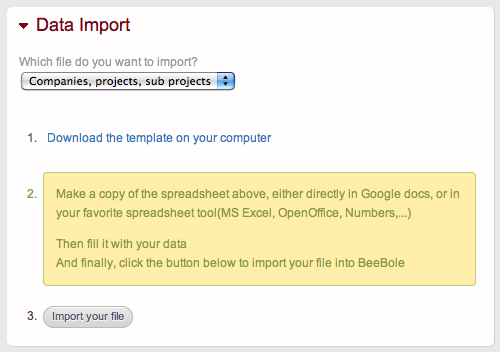 Feel free to contact us at support@beebole.com before importing your file. Then click the corresponding CSV link to download it to your computer and edit it with Excel, LibreOffice, etc. When there is an orange corner on a header box, mouse over it to see the helper comment. eg: if you don't have ID's, or you don't use sub-projects. Just leave these columns blank. If you import projects, you need to fill out the column Company. If you import subprojects, you need to fill out the column Project. The CSV file will be downloaded to your computer. The import will start automatically. You can either wait or tick the option to receive an email when the import is done. You shouldn't give any meaning to the internal ID we use. If you need ID's for another system — eg: client IDs for accounting, or people IDs for payroll — you can use the ID column. 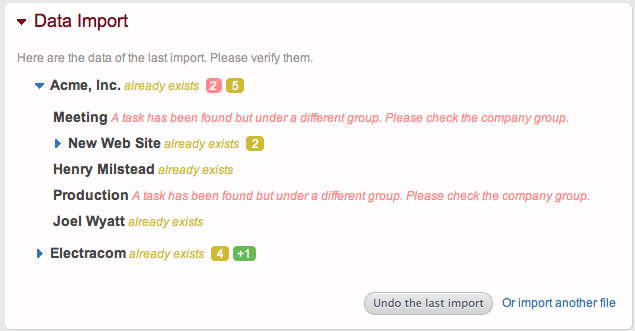 If not, just leave the column empty, and the import will try to match by the names. Once you have imported your data you will see in Data Import a summary of the import. Please check it carefully in case of errors(in red) and warnings(in orange). The records imported successfully appear in green, or without a comment. Or just simply to check if the imported data looks what you were expecting. If you see something wrong in this summary, you have the option to undo the import. Please note this works only for the last import. Start with just few lines for a new import, especially if this is your first one. Run the import and check carefully the result, before launching the real one. When you have selected your file, it is sent from your computer to our server. Your background job is then placed in a queue waiting to be run. If you are the first in line, it is executed immediately. If not you get the approximate time to completion. Either you wait, or choose the email notification option to be warned when it is completed.